Guyana’s minimum State pension has been increased, Minister of State Joseph Harmon announced Thursday. He said the new figure is now GY$360,000 annually, up from GY$200,000. That means the new monthly State pension would be GY$30,000 instead of GY$10,000. FLASH BACK: President David Granger and Professor Noel Menezes. He described her as “most deserving”. Professor Menezes lectured at the University of Guyana for several years. She will be 88 years old on July 14, 2018. 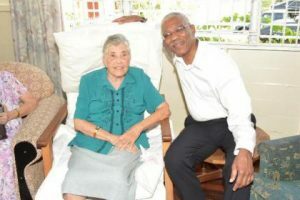 Among her students was President David Granger. Harmon explained that the State Pension Act provides for the eligibility criteria. He said Professor Menezes was selected “based on the experience, based on the quality of service” she has provided and the need for her to have sufficient funds to have a decent standard of living in her latter years.